We had the honor to participate in paying tribute to the Memphis Alumni at the 37thAnnual Distinguished Alumni Awardsfor the University of Memphis . 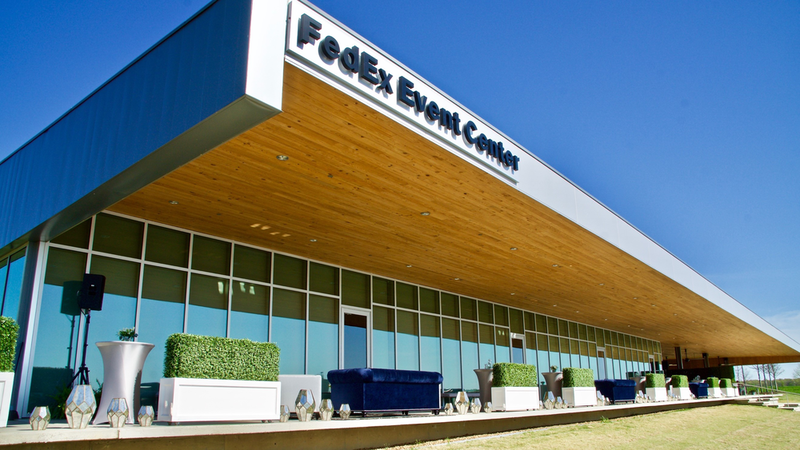 The award ceremony – held at the FedEx Event Center located at Shelby Farms – spotlights University of Memphis alumni who have performed renowned services for the community, the state, and the nation, with that in mind. 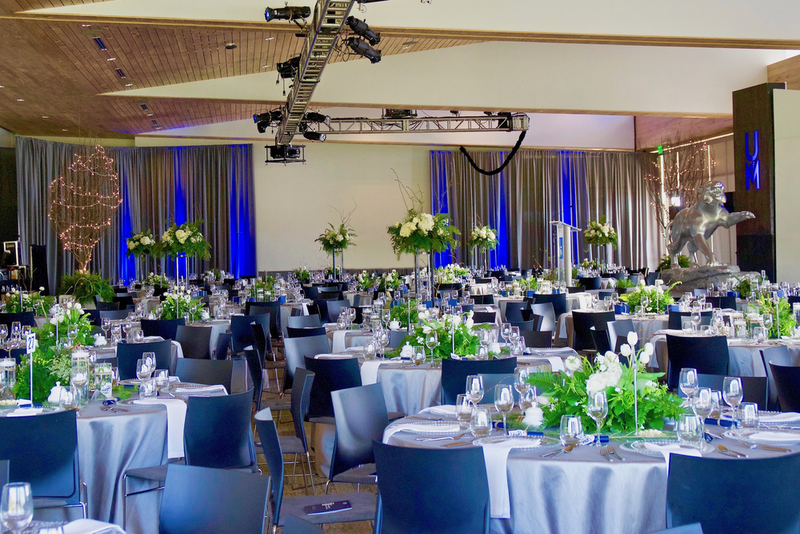 Drawing inspiration from official colors of the university, the upscale experience was completed with blues and greys. One of the standout additions to venue is the open patio that overlooks a glistening pond and Greenline. To create an outdoor haven for guests to enjoy, our short boxwood hedges, blue velvet sofas and reflective mercury lanterns were aligned along the edge of the patio, creating a border that allowed the setting to feel both intimate and open. 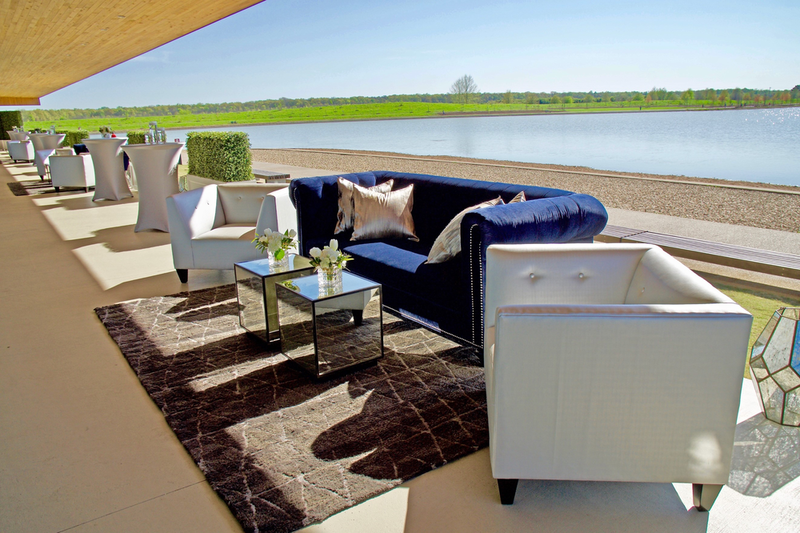 Within the patio perimeter we brought in modern pieces for lounging and socializing that blended an array of textural elements while keeping true to the event's color palette. We balanced the boldness in our velvet sofa's blue by pairing it with soft-colored silver Sophie club chairs and geometric accents. The geometric pattern of the Marrakech rug and mirrored front of the Axel cubes also blended with the border's Art Deco-styled mercury lanterns that would beautifully bounce sparkles of the sun's rays off from its sculpted edges. As guests entered the lobby, they were met with a vibrant display of the night's wine pull raffle. The vignette showcased a plethora of wine bottles on Singapore consoles and end tables with our boxwood hedges placed along the wall for a vibrant background. The main ballroom hosting the night's dining and ceremony continued to incorporate the color palette of Memphis blues and greys with splashes of fresh greenery all over as subtle but impactful nods to the growing nature of Shelby Farms Park surrounding the venue as well as the inspirational growth the honorary guests were being awarded for.